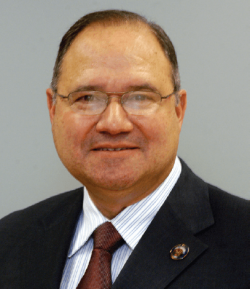 Freeholder Angel G. Estrada was first elected to the Freeholder Board in 1999. He served as Freeholder Chairman in 2004 and Vice Chairman the previous year. He was re-elected to a sixth term in 2014. Freeholder Estrada was the first Latino elected to the Freeholder Board and has more than 30 years of business and public service experience. A long-time education advocate, Freeholder Estrada was elected to the Elizabeth Board of Education in 1994 and re-elected in 1997. He secured state funds for expansion and renovations, and brought college recruiters to Elizabeth’s schools to encourage students to pursue higher education. Long before his election to the school board, Freeholder Estrada was active in community issues and served for many years in several Parent-Teacher Organizations, often as president. As Freeholder Chairman in 2008, he presided over the expansion of shared county-local services, Phase III of the Workforce Competitiveness Project, and Go Green, a comprehensive environmental program. He has been instrumental in open space preservation and county-local tree planting in the 21 municipalities, worked with private and non-profit sectors to fund youth recreation and help municipalities improve athletic fields, and worked with the United Way to help bring the 211 information line to Union County. Freeholder Estrada also supported the Freeholder Scholars initiative, which provides scholarships to Union County College for eligible residents. He helped implement the Access 2000 initiative, providing school districts with funds for computers, Internet access, and technology education for teachers. As chairman of the Open Space Trust Fund Committee in 2005, Freeholder Estrada oversaw the distribution of more than $1.4 million for Children’s Recreation and Historic Preservation. Freeholder Estrada works closely with Latino community organizations to bring their voices and concerns to the Freeholder Board. He is a member of the Board of Trustees of Meadowlinks, and is also the Chairman of the North Jersey Transportation Planning Authority. Under Freeholder Estrada’s leadership, Union County has advanced almost $3 million in safety improvements and nearly $38 million in local roadway and bridge projects. He served on the Elizabeth Housing Authority for five years in the capacity of member, vice chairman and chairman and is a board member of the Selective Service System. In 2007 and 2008 Freeholder Estrada was elected Vice President of the National Association of Hispanic County Officials. Freeholder Estrada emigrated from Cuba to the United States 58 years ago and has made Elizabeth his home ever since. He earned a Bachelor of Arts degree in History and Spanish from Kean College (now Kean University) in Union. Freeholder Estrada and his wife Teresa have three children: Liliana, Jorge, Daniel, and two grandchildren, Keith and Alexandra.